With the new tidal wave of smartphones hitting the market ( Smartphones account for a full half of all mobile phones as of February ) you need to make sure that your business can not only be found online, but you also have to make sure those smartphones can pinpoint your physical location as well. 90% of all smartphone searches are local. 87% of those users searching then take some sort of direct action. To make sure your business is in position to capture those mobile users when they take those actions, you should be doing some basics to make sure your online presence is optimized for local search. Here are the very basic beginner steps you can take to make sure users can find your business when they’re out and about and searching. 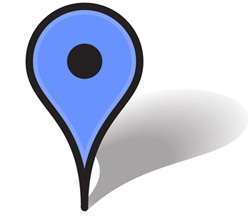 When listing your address on your web site, make sure that it’s a full address that displays your physical location accurately with the widest range of popular online mapping solutions. A P.O. Box isn’t going to do you any good here. Don’t get hung up on whether it’s technically the right mailing address or not, the focus is going to be on getting people to your doorstep, not on how they’re going to contact you via mail. At the very least, you’re going to want your address on your home page as well as on quite a few of your main content pages. Your address shouldn’t just be relegated to the “Contact Us” page anymore. Having it as a permanent fixture in a header or footer (along with your phone number) isn’t a bad idea. Mae sure your business profiles on all the major search engines are filled out completely and accurately. In the cases of Google Places and Bing Business Portal, the services work hand-in-hand with their mapping products. They’re generally easy to claim and populate with your business info. Some even allow you to setup special offers and discounts for free on the basic listing. Make sure you place yourself in a category (you can choose up to 5) and be specific. Being in the proper category is important as a lot of mobile search will rely on those categories to help users nail down specific results. Just choosing “restaurant” isn’t as effective as choosing “restaurant,” “Italian Restaurant,” and “Vegan-Friendly Restaurant.” Make sure you choose from Google’s pre-populated list, as those tags will perform better in search than if you enter your own. You can add photos (directly) and videos (via YouTube) about your business. Any extra information you can give a potential customer about your business might give you the edge over a competitor during the decision making process and photos, as the old cliché goes, are worth a thousand words. Google allows you to enter “offers” as well as a tiny but of customized content that displays on your Places page that can be tailored on a regular basis. Bing’s offerings are about the same as Google’s with a few exceptions. Bing offers a simple “mobile website” tied to Bing maps that is generated from the business account information you enter. You can add a listing (up to 10) of key products and specials that is broken out and indexed in your listing. Claiming your Facebook “Place” can be tricky if you already have a brand page established and they are not one and the same. The two can me merged but you have to make a choice over which page, users, and content become the default. If you’ve already invested a lot of time and effort in establishing a Facebook presence you want to be sure not to lose your user-base when you merge. But, as we’ve established before, check-ins can be a powerful marketing tool, so you’ll have to weigh the risks with the rewards of combining the accounts. It’s easy to forget the original front-runner in location based online presences in the slew of other options, but it’s still a good idea to make sure your Foursquare information is claimed and squared away (no pun intended.) Their large user base still prefer to use that service exclusively for check-ins even though they don’t have as much of an impact on traditional search-based activity. Take advantage for Foursquare’s tracking ability to reward customers who visit and check in frequently like a digital punch card. This entry was posted in Mobile and tagged Check-Ins, Location, mobile, Optimization, Places, Search. Bookmark the permalink. Great blog that addresses some of the major players in the local search arena. You mentioned adding your physical address to your web site and claiming your “place” pages as a must, and I agree. I would also add as a rule to make sure that each and every address entry across all these sites looks exactly the same (St. vs Street, PO vs P.O., 5-digit vs 9-digit zip, etc.). These, and other sites, scrape data to create new entries all the time, and a consistent format of your address will prevent duplicate entries and make claiming all your property listings that much easier.